The decrease in airway pressure at 0.1 second (P0.1) after commencement of a tidal inspiratory effort against an occluded airway has commonly been used as an index of neuro-muscular ventilatory drive (64-66). The value of P0.1 depends not only on the inspiratory center output, but also on several other factors, including: (1) the intact neural pathway to the inspiratory muscles; (2) electro-mechanical coupling; and (3) the pressure-generating capacity of the inspiratory muscles and their velocity of shortening (see Tests of Respiratory Control in Section 1 of this Statement). Figure 2. Subtraction of the area subtended by the inflation pressure (Prs)-volume (right) or -time (left) curve in the presence of inspiratory muscle activity (B) from that recorded during passive inflation (CMV, controlled mechanical ventilation; A) yields the work of inspiration performed by the patient (AMV, assisted mechanical ventilation; shaded area, C) and the pressure-time product (/ P dt) of the inspiratory muscles. Reprinted by permission from Reference 53.
sure-generating capacity due to respiratory muscle weakness and fatigue. Furthermore, in the presence of dynamic hyperinflation and PEEPi, P0.1 measured as subatmospheric pressure 100 seconds after the apparent onset of effort, neglects the respiratory effort required to draw down PEEPi. These factors must be kept in mind when evaluating P0.1 in the ventilator-dependent patient. In a patient with abnormal airway resistance breathing through an intact upper airway, the true value of P0.1 may be underestimated because of the long time constant, retarding the transmission of pressure changes from the alveoli to the mouth (67). In contrast, in a ventilator-dependent patient who has a rigid endotracheal tube bypassing the compliant region of the upper airway, P0.1 may more accurately reflect esophageal pressure changes and thus neuro-muscular drive (68). P0.1 is generally increased in patients with acute respiratory failure (69), although an authoritative study on the repro-ducibility of P0.1 measurement in the ICU setting has yet to be performed. In mechanically ventilated patients, P0.1 has been used to: (1) assess respiratory center output while changing the fraction of inspired oxygen (FiO2) (70); (2) predict weaning outcome values of P0.1 & 6 cm H2O suggesting that discontinuation of mechanical ventilation is likely to be unsuccessful, while values « 4 cm H2O suggest that weaning is likely to be successful (71, 72); and (3) set the appropriate level of assisted ventilation (73) and pressure support (56). Measurement of P0.1 does not require sophisticated equipment, and a two-way valve and differential pressure transducer are sufficient. In ventilator-dependent patients, the procedure can become even simpler because the valves necessary for the measurement already exist in the ventilator. Indeed, to trigger a mechanical breath, the patient has to generate a small negative pressure at the airway opening, which opens the valves and allows the passage of inspiratory gas. In some ventilators, e.g., the Siemens Servo 900C, the time to open the valve exceeds 100 milliseconds, thus providing sufficient time to measure the P0.1. This modification has been used successfully by Fernandez and coworkers (69) and Conti and cowork-ers (74) to measure P0.1 in patients with intrinsic PEEP (see subsequent text). Kuhlen and coworkers (75) introduced an automated method to measure P0.1 in ventilator-dependent patients using a standard ventilator (i.e., the Drager Evita). These authors correctly underscored the breath-by-breath variability of the measurement. 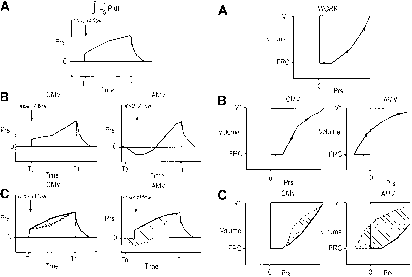 In this connection, it has to be mentioned that expiratory muscle activity may increase the P0.1 variability and generate unreliable values. In summary, P0.1 can be measured in ventilator-dependent patients and taken as an index of neuromuscular drive. High values of P0.1 are considered to predict weaning failure, whereas low values of P0.1 suggest that mechanical ventilation can be discontinued, provided that factors that can impair the pressure-generating capacity of the inspiratory muscles are excluded.